This prototype Electric Tram is being tested in China, it runs on white painted lines in the road. 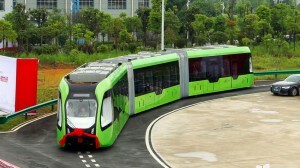 Its highly advanced batteries give it amazing serviceability and it carries over 300 people. Everyday I’m sent examples of new ways of developing electric transport capabilities. From cars to aeroplanes the future is electric and combined with the enormous development of renewable energy we are entering a new fossil fuel free era. We can dramatically reduce pollution which effects everyone of us going about our daily routine. We can begin to reverse the worst forecasts of climate change and together make our Planet once again safe for the generations to come. Join us in spreading the word that the UK should be taking a lead in developing renewable energy and of course majoring on moving from petrol/diesel powered transport to electric or eventually even hydrogen. None of our political parties are focussing on renewable energy or climate change the most important issues of our times. Hold your potential MP’s locally to account and make commitments of support on both subjects. Our commitment is clear, to the Planet, to landscape, to people and of course to the Natural World. Tell us your own stories about installing solar, buying an electric car anything that will give confidence to other people thinking of making changes. Forward our website details to all your friends, relatives and colleagues. Lets shout about this new energy and really get the show on the road here in the UK. At Letsgetenergized we believe that local sustainability is hugely important and in partnership with a move to renewable energy will begin to drive back climate change and protect the Planet. As someone who finds it difficult to grow vegetables this initiative by Pam and Ken to engage and develop growing your own is excellent. Do support them if you can!! As Ken or I may already have mentioned to some of you, we have set up two local groups on Meetup.com which you may be interested in joining – if so, please click on the relevant link below to register as a member (free of charge) so that you can receive email updates and come along to our talks and meetups. If you are not interested, or have already joined, sorry to bother you, but please do forward this email on to anyone else in North Dorset you think might like to join either of our groups. If you are going to move to a new home soon, you might want to consider ways to make it more energy efficient and green. While it is true that the whole situation is stressful enough, indicated by the fact many surveys rank this among the most difficult tasks one has to deal with in life, it is also true that moving house presents many new opportunities. One of the most important things you can consider for your home is implementing green technology and features. Now is the perfect opportunity to become a better eco-friendly person, start a new life in your new and improved home. 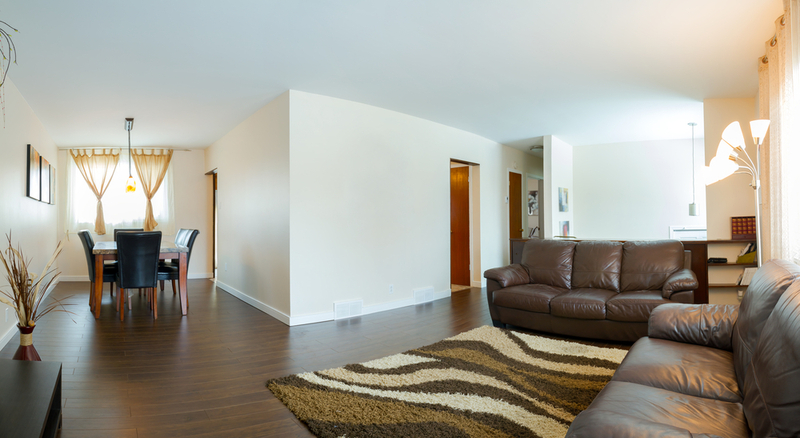 Relocation to a new place is your opportunity to live in a home that is green and less taxing on the environment. Rainwater harvest system – that is one thing you should definitely consider for your new home. An RHS allows the collection of rainwater from your rooftop, which would normally go to waste. It is a precious resource, which the system will store in a tank, allowing you to utilise it later for various needs. Collected rainwater can easily be used for various cleaning tasks, all of which you will have to perform a lot of after relocation. The benefits of having an RHS installed in your home are huge – it can save you up to 50% of your water bill, which is not a small amount at all. Solar panels – solar power has become a widespread reality. Many homes have panels installed, and this is very good, because it is a great way of saving energy and utilising a renewable source for power. The thing to consider before moving house to a place with solar panels is that the investment is a rather large one. You can expect a long-term return, but that should not stop you from implementing this project in your home. Energy efficient electronics – if you want to pay less for moving services, you can leave part of your old electronics behind or sell them in order to acquire new and more energy efficient ones. This is definitely something to consider, because it not only makes your move easier, but also makes your new home much more eco-friendly and green. Wind turbine – another great way of making your home more eco-friendly is to harness the power of the winds by mounting a wind turbine on the roof of your new home. Even small models can make quite a difference in reducing your electricity bill. Of course, you have to keep in mind whether or not the conditions are good – your home must be in an area with plenty of winds, otherwise the turbine will not produce electricity. It is by implementing these 4 features in your new home that you can make it green and eco-friendly. Definitely consider the upgrades, because they are worth it and their positive impact on the environment will be noticeable. This post is by Guest Energizer Sofia Lewis for: Islington Van and Man Hire. She is a passionate freelance article writer and blogger. She is inspired by home improvement projects and writes mainly about house removals, storage, office relocation, green living home solutions, other home related topics. As the Environment and Community Services Apprentice for North Dorset District Council. The Renewable Energy Marketplace 2015 provided me with an excellent opportunity to find out more about local companies as well those further afield who shared my general philosophy and interest in renewables with a view to identifying possible future employment opportunities. I was grateful to Vince Adams, co-founder of Energise Stur Valley who very kindly sponsored my attendance as well as providing transport to the event in his electric car, so minimising our impact on the environment. I was extremely fortunate that following an initial discussion, a local renewable energy company offered me a post as administrator. Although extremely flattered I indicated that I wish to complete my apprenticeship at North Dorset prior to securing further employment within the industry. The event hosted a good range of companies including installers, facilitators and informers. At the start there was a stimulating debate between the local (to Exeter) leaders of the Conservatives, Labour, Liberal Democrats and The Green Party. They took questions from attendees and there were clearly many differences in opinion. Diana Moore representing The Green Party made clear her disagreement with the views put forward by Neil Parish representing the Conservatives. The debate has not affected who I plan to vote for in the upcoming elections, although it has encouraged me to undertake further research into the finer details of each party’s policies. The stalls were well grouped in terms of subject matter and the stall holders were all very approachable, knowledgeable and keen to promote their organisations. The arts and communities section was of particular interest and through discussion I met a fellow attendee who is considering putting on an Eco Fashion Show in Dorchester, so I may get involved in this as I enjoy textiles and fashion. There were various seminars including one on arts and energy which discussed Whitby the Musical, a performance which uses the opportunity of using musical theatre to portray a positive image of the renewable energy industry. It would be the first of its kind and a brilliant way of getting local communities on board with a renewable energy scheme and raising awareness amongst young people. Outside the exhibition area there were several electric and hybrid cars, which in addition to my conversation with Vince travelling to and from the event, persuaded me that they offered a viable future mode of transport, particularly now that charging points are more widely available including at service stations. The choice of cars available on the current market is varied ranging from a little run-around such as the Toyota Yaris Hybrid to the larger BMW i8. Some of the cars could be test driven which was a great way to attract future customers and raising interest in them. The Renewable Energy Bake Off was quite a success and there were some very decorative cupcakes with wind turbines, solar panels and other renewables iced on which someone had carefully crafted. The cakes were delicious and particularly welcome given there was little else on offer in terms of food at the event. Next time, I would suggest having a greater range of stalls providing local produce. In terms of attendees it appeared only to attract those already involved in the renewables market in some way, rather than wider members of the public. I feel it would have been beneficial and more attractive to wider audiences if admission had been free rather than £18 entry plus £54 if wishing to attend a conference. Overall the event was a success with Westpoint in Exeter buzzing with environmental enthusiasts and companies. There were many interesting organisations and individuals available and it was an ideal opportunity to network. I hope to attend again in the future. EV’s are not good for the environment! That headline or similar claims have been floating about the media for some time now. A 2014 study by the University of Minnesota among others found that EV’s can contribute to global pollution if the source of the electricity they use is not clean. Why the headlines don’t read, “Coal Fired Power Plants are a Threat to Civilization” instead of lambasting EV’s is no mystery. Most of the articles quickly get to this point but headlines lambasting coal fired power plants don’t draw the eyeballs that anti-EV banners do and media of all sorts depends on attracting eyeballs for validation. The potential number of EV’s on the road is far greater than the number of power plants so why not focus the cleanup at the source. The fact is that EV’s are good for the environment. You can power them with wind, solar, hydro, nuclear and yes, fossil fuel. But whatever the source EV’s don’t go around spewing CO2 and other pollutants into cities towns and the countryside. If clean up is required it can be done at the source. Additionally, if you choose to power your EV with sustainably derived electricity you do away with the need to transport explosive and toxic materials around the world in ships, trains, trucks and pipelines and avoid all the spillage associated with that transport. EV’s don’t require mountaintop mining, deep sea oil drilling or other destructive extractive processes. Technologies are already available to scrub pollutants from power plant stacks but that would add to the cost of electricity. Most consumers would rather pretend that the hundreds of billions of dollars, pounds, rand, yen, etc. added to global health costs by the fossil fuel industry do not exist and that the rise in power cost would be far more onerous than the heart disease, lung disease, lower intelligence in offspring and many other problems associated with fossil fuels. 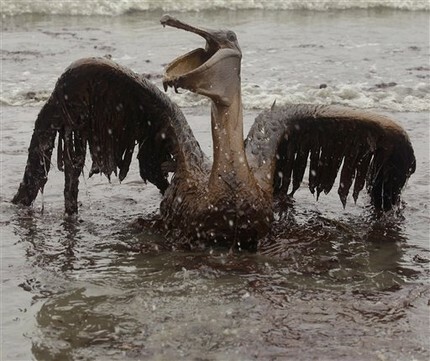 And by the way, if fossil fuel companies were required to clean up their messes the price of fossil fuels would be quite a bit higher than the price of sustainable energy. This cost adjustment would drive the sustainable industry, technological improvements would follow rapidly due to the increase in research funding and the world would be a much cleaner place. EV’s are not the problem, the problem our insistence on “cheap” energy no matter what the true cost. "I agree fully with your smmary that it ultimately depends on the source of the electricity. In the UK the carbon emissions associated with electricity generation for a typical electric car like the Nissan Leaf are as good or better than the best diesels. However, this is getting better all the time due to higher renewables penetration. I would also estimate that those with electric cars are much more likely to be on “renewable” supply tariffs or have solar panels on their house and therefore will have lower emissions than the UK average. Of course, electric cars produce no emissions (other than manufacture) in countries where grid electricity is 100% renewable such as Norway, Iceland and Costa Rica and in these countries electric cars win hands down. " "Get the message, we are being feed rubbish from the Media to protect the existing forces of power, its time to wake and see whats happening before our own eyes or it will be to late. " As Zero Waste Week continues this week, I thought I would share a couple of films I have been recommended on the subject of reducing waste. Perhaps this is something like me, you can add to your #ZeroWasteWeek pledge (i.e., watch the films and be inspired, or maybe prodded more likely, into action!) or maybe Dorset Energized will put on a screening sometime – please let us know if you want to get involved with a film night or know anywhere in Dorset screening these! Trashed – No Place For Waste, starring Jeremy Irons, looks at the risks to the food chain and the environment through pollution of our air, land and sea by waste. The film reveals surprising truths about very immediate and potent dangers to our health. It is a global conversation from Iceland to Indonesia between the film star Jeremy Irons and scientists, politicians and ordinary individuals whose health and livelihoods have been fundamentally affected by waste pollution. Visually and emotionally the film is both horrific and beautiful: an interplay of human interest and political wake-up call. But it ends on a message of hope: showing how the risks to our survival can easily be averted through sustainable approaches that provide far more employment than the current ‘waste industry’. The film premiered in Cannes 2012 and has won 8 awards. There’s so many more great looking environmental and food themed films out there I want to watch, but these 3 should do for now! It’s all going on this week here at Dorset Energized, and its all good!!! Dorset Energized are very excited to be working with the inspiring duo Debbie Hyde and David Durant who have created their own internet radio show entitled It’s All Good as co-founders of Media for Good, which is a non-profit partnership with the aim of harnessing the power of media to effect change towards a more sustainable economy and protection of the Earth’s resources. You can tune in to stories, news and interviews with people like you – creating a bright clean energy future, every week on the It’s All Good radio show podcasts on Renewable Energy which will also feature contributions from the Dorset Energized Team including our bloggers Vince Adams and Keith Wheaton-Green. Do YOU support a 100% Clean Energy Future? It’s All Good Radio Show is an internet radio show produced and presented by Debbie Hyde which is broadcast at 9pm GMT on http://www.brooklandsradio.co.uk. 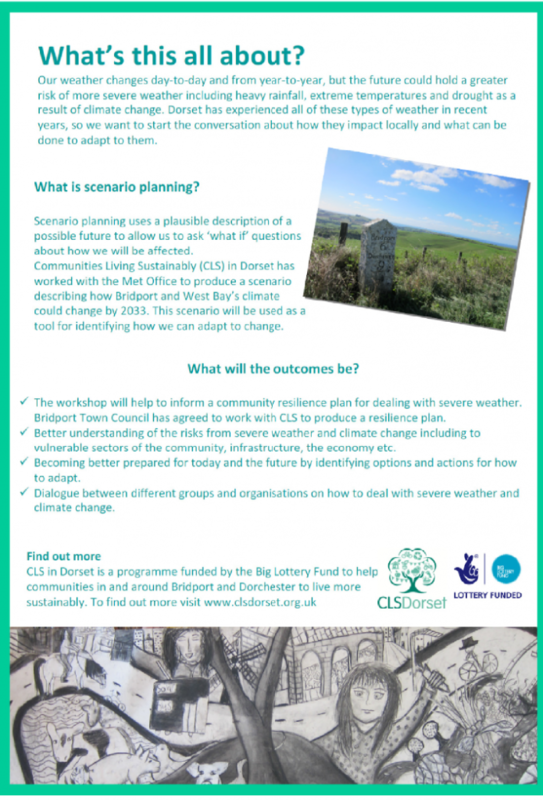 Dorset Communities Living Sustainably has arranged a workshop about climate change and severe weather on Wednesday 30 July at Bridport Town Hall, starting at 5.30pm (registration from 5pm). The workshop will finish no later than 8.45pm and a light buffet will be provided during the evening. As you can see from the attached invitation, the workshop will be presented with a possible scenario (circulated in advance) about future sever weather events that the community could experience, which will be used as a basis how Bridport and West Bay could be affected and options for how we can adapt. Find out about the benefits of renewable energy at a seminar organised by North Dorset District Council at the Springhead Trust, Fontmell Magna on Monday 9 June. This free half-day seminar titled ‘Opportunities in Renewable Energy’ will inform Town and Parish Councillors, Neighborhood Planning Groups and others about how they can benefit from renewable energy technologies. Delegates will learn about commercial schemes and how communities can negotiate with developers. They will also learn about best practice elsewhere in the country. Presentations will be given by Dorset County Council, local company Community Heat & Power and regional support organisations. 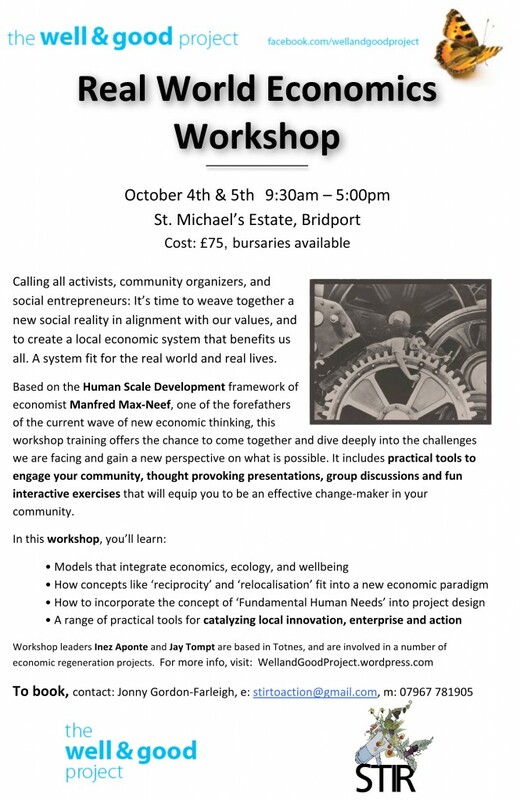 For more information and to book a place, go to: http://dorsetreseminar.eventbrite.com or contact Paul McIntosh, Sustainability Officer at North Dorset District Council on 01258 484019. "This initiative by NDDC is most welcomed as a push for those of us interested in creating and opening Community Renewable Projects. Clearly with so much to learn small groups like Stur Valley Energy and its IPS can benefit from help and assistance in insuring that there projects gather momentum and support from planners/authorities and in people in general. Clearly communities can benefit greatly from the whole notion of working together and we believe that anything is possible and will eventually ease the burden of rising energy costs and tackle some of the causes of climate change. Support Paul and his work at NDDC by attending the Seminar. " How to destabilise the Green Energy Market? Sent to us by Sally Cooke. This highly pertinent article might be of interest for Dorset Energized readers.